Pimlico is a comparatively new district of London, recorded as Pimplico in 1630. It seems that the name was copied from a garden of public entertainment in Hoxton (north London), named after its owner, a well known inn-keeper, Ben Pimlico, whose name was also given to his inn (late 16th-century). There was once a Pimlico Walk in Hoxton. Pimlico, on the north bank of the Thames, was almost uninhabited before the 19th century. 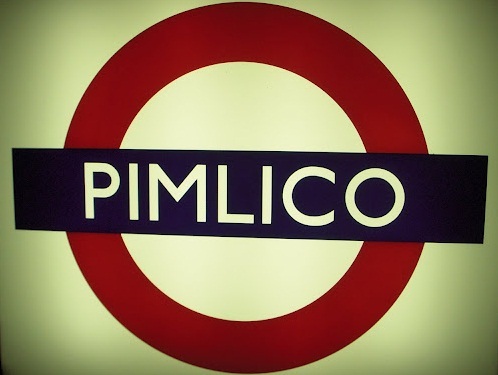 The station was opened as PIMLICO on 14 September 1972.